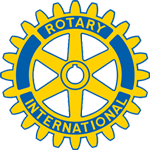 At our Club Assembly Meeting last Tuesday Aaron Carlson spoke to his fellow members about Rotary International's efforts to eradicate polio. Since 1988, we’ve seen a worldwide reduction in polio cases of 99.9%. Last year we only saw wild polio cases in three countries. This month's Happy Dollars and fines will be donated to the Rotary Foundation for this cause. The Bill and Melinda Gates foundation is matching any donations 2 to 1.